Clogged Sink? Practical Tips To Fix It Instantly! Our experts put together an easy how to guide when it comes to fixing a clogged sink. Find out what to do and how to solve the problem right away! Bathroom sinks are highly resilient to clogs when you consider all of the junk that goes down. The buildup is what eventually gets it, but that doesn’t mean you need to rush and call a professional. Unclogging any sink is one of the most basic DIY home projects, with the bulk of the work going into preparation. If you’re quick, then there is a good chance that you’ll notice a bathroom sink getting slow before it gets clogged. This is the most ideal situation, although many people aren’t this lucky. In either case, a lot of money can be saved by having only a couple of tools available. Make sure to have everything ready before starting the repair. There are a couple of important tips that go a long way when fixing any water based home appliance. Although the rate of success varies based on the type of sink, failure won’t do any damage. Clogs are the most common problem with bathroom sinks, so identifying and fixing them saves a lot of money. Saves hundreds of dollars in repair costs from having to call a plumber. Per hour, plumbers charge $45 to $150 for their services. Unclogging a bathroom sink would take less than an hour but would most likely incur the full hourly charge. On a scale of 1 to 10, the difficulty of this project is on the low end, probably a 4. It’s not time consuming, and the price of the tools is so low that it’ll barely make a dent in your wallet. Difficulty comes from the physical parts of the project rather than the technical. You can see when a clogged drain needs to be fixed before it gets to the point of no return. Bathroom drains that are slow to get rid of water are teetering on the edge of getting clogged. Finding the warning signs early allow you to dispatch over the counter chemical to clear things out before they get worse. More than one approved way exists to clear out drains. Some will be more effective than others, so it comes down to picking the tool that does the job best. There are no ‘surefire’ ways to clear a drain that works with a 100% guarantee. There are so many different types of drains that it may become necessary to try multiple fix methods. A tool that is favorable for one project won’t be feasible for another, so unless you have identical bathroom drains, expect to use multiple tools. If you have to mess with the pipes, then prepare to be in an uncomfortable position. This includes being in a tight space, no matter the layout. Users with back or arthritis problems should consider alternate methods if the project lasts for longer than half an hour. Clogs that are left unchecked are a big risk since they can destroy the pipes. Burst pipes are in a different category altogether, requiring a different set of tools and expertise. When things get bad, the water leaks into the sink, the floor and sometimes through the entire home. Here are the best tools for the job, where some (but not all) will get the project done for a low price. In ‘The Job’ section there is a lot more clarity on the necessity of specific materials. Attention to the details is still the most important part of the job. A helper is not required, but an extra set of eyes is always a good thing. Drain Remover Tools – They go by different names, with the more common one having snake in its name. The other alias is zip it tool, so no matter what brand/name you decide on they will all do the same thing. The difference is in quality and extras features, with the bulk of the bells and whistles concentrating on comfort options. Get a long one, and if it is cheap, get a multipack. Gloves/Mask/Hand Sanitizer – With all of the accumulated bacteria you’ll be handling, these three things are a must. Gloves types are going to be based on the type of work you’ll be doing. When using drain removal tools, a comfortable material is preferably to keep the task from grinding into your hands or fingers. When dealing with the pipe directly, flexibility and grip is more important. Cater the type of glove you need to the task even if it becomes necessary to buy different pairs. 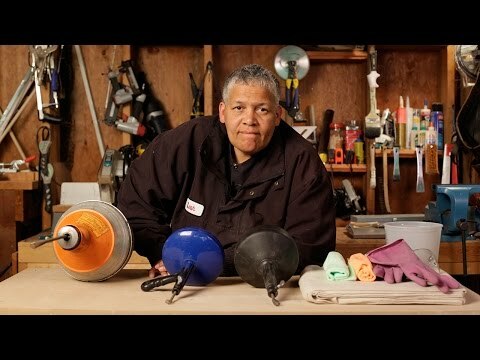 Drain Clog Remover (Solution) – This is powerful stuff, and in the wrong hands can cause serious injury. When used in excess quantities there is a chance it will damage the same pipes that it’s supposed to be unclogging. Follow the directions and use caution for the most effective use, even when using cheap solution. 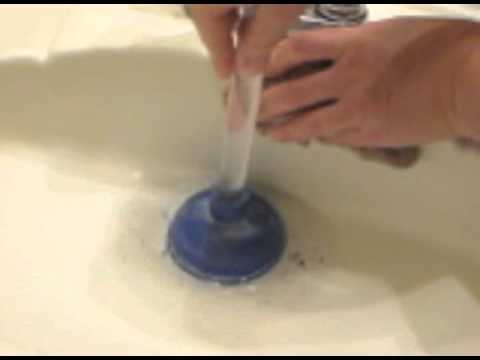 Plunger – A trusty plunger with some power behind it can start and finish sink projects. Sometimes it does too good a job when used, so practice restraint while plunging. Flashlight – Using a bright LED flashlight will let you see down the drain. Blockages spotted with a flashlight can be removed without having to blindly look for the problem. Bucket – With a nice sized bucket you’ll be ready to catch any water or throw away any excess materials. Screwdriver/Screwdriver/Wrench – These tools are helpful for just about all methods used to unclog bathroom sinks. Wet And Dry Shop Vacuum – Only for the jobs that are a bit too complex for the other tools. For everyday clogs, this is classic overkill. Use this only as a last resort when everything else fails. Replacement P-trap – Having a replacement on standby is smart when you don’t know the extent of the problem. P-traps are inexpensive, so having a replacement ready is no different than stocking up on lightbulbs. Rags/Towels – Cleanup duty is going to be a bit much without these, so try to skip the plastic alternatives. Go for old or new rags/towels with a lot of soaking power. Remove everything from the surrounding area that is in the way. That includes items in the cabinet below the sink that may get damaged from water. Look for any significant signs of water damage, as this could point to a bigger problem than the clog. Having the most room to operate will keep the project simple, but working in tight spaces will be evitable for some homes. Place your towels under the sink and surrounding the edges. Depending on the project, here are the tools you’ll have to rely on. Mandatory tools for all of the jobs are gloves, mask, hand sanitizer, bucket, rags, towel, drain clog remover (solution), flashlight and an optional replacement P-trap. No matter what method you use, finish it with the drain clog remover (solution) to fully clear out the pipes. The easiest of them all requires one tool. For a thin snake, removing the pop-up/sink stopper isn’t a problem since it can fit through the hole. A couple of tries will be needed to clear up all reachable gunk, so expect to come up full on one pass and empty on another. If you want to go a little further, remove the popup with your hands. Older bathroom sinks need the assistance of a screwdriver to finish removing the popup. After the popup is removed, go to town with the snake tool again. Just about everyone has a plunger, yet not a lot of people know how to use it. Start by removing the pop up/sink stopper, using a screwdriver if necessary. Place the plunger in the sink and begin filling it with water so that it covers an inch of the plunger’s bottom. Push the plunger down all the way until it feels like there is a tight suction over the drain. Begin pumping with it, paying close attention to the feel of the plunger and whether it is forcing the blockage down. When the water flows down strong, use your flashlight to see if there are any more blockages. If so, repeat until it is clear. Sometimes the blockage is stuck in an area where you can’t get to it. Place a bucket underneath the P-trap so that excess water is caught. Remove the P-trap with the correct tool, usually a wrench or screwdriver. If the blockage is within the P-trap itself, then consider replacing it with a brand new one. Otherwise, clean out the old P-trap until it is as good as new. 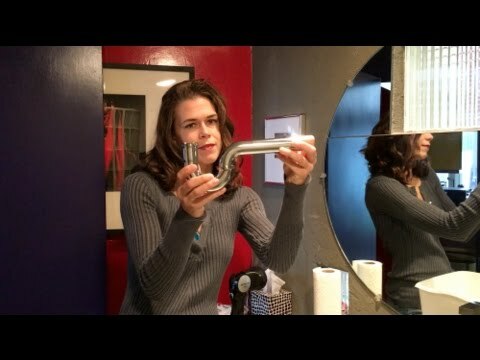 Use a snake to clean out the pipes since they are exposed. This is a good way to get rid of any extra problems before putting everything back together. This is the last resort for clearing out a clogged bathroom sink. Most projects don’t need this type of power, but it is also a good way to not get your hands dirty. Put a bucket underneath the P-trap and undo it with a wrench or screwdriver. Find the vertical pipe that goes up to your clogged sink, as this will be what you attach the shop vac hose to. Plug the opening of the sink tightly so that the shop vac can be effective. Once it pulls out the clog, do some light clean up and put everything back together. With all of the materials listed, these projects might look expensive from a distance. It’s quite the opposite, even if you don’t own any of the tools. Can Removing A Clog Damage The Bathroom Sink? Yes, you can even damage the P-trap by removing it. Some of these parts are so worn that replacing them sooner rather than later is the smarter idea. That is why the P-trap purchase is vital in ensuring your hard work wasn’t for nothing. Fixing a clog on a bathroom sink that has leaking issues won’t solve the much bigger problem of failing parts. Will Generic Tools Handle The Job? This depends on the tools you’re planning to get. Users won’t have many instances were a $20 plunger is a smart investment. And it isn’t a foregone conclusion that branded solutions will clear out clogs. Putting a lot of money into a liquid drain solution is no smarter than getting a $20 plunger. Place your bets on the tools that will handle the heavy lifting since those brands will have the most desirable features. Is There An Easier Way To Unclog A Bathroom Drain? All of the methods listed are beginner friendly, but try doing this as a check; make sure the sink stopper isn’t activated. While this may sound like a dumb solution, there have been plenty of stories where an amused plumber refused to charge homes for ten seconds of work. Let us know what you think of the information provided in this article.